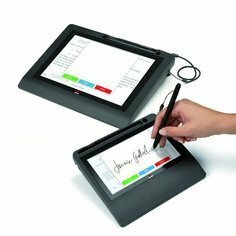 Olivetti launched a new family of signature pads (TRUSTED SIGNATURE PAD) with enhanced technical characteristics and improved features. 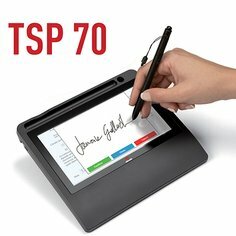 TSP was born thanks to the relevant experience of Olivetti in projects where Handwritten Biometric Signature is required. 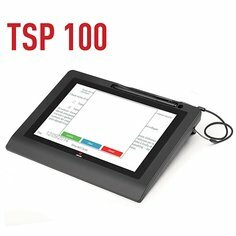 Digital Signage:TSP can be used to send marketing and advertising information to the client, in front of the operator, while it is in a static state. 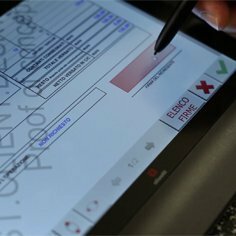 When the operator decides to send the document to the signature pad, the display mode is automatically switched to the document display. Once the signature has been successfully applied, the device is automatically switched back to the marketing mode. 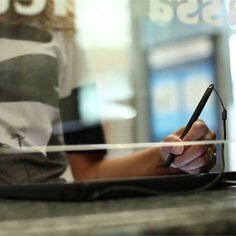 The media content to be sent to the signature pad can be configured and customized in order to target the specific profile of the client that is currently in front of the operator. TSP Digital Signage feature can be integrated with the existing Digital Signage engines of the company.